Judge- Mr Dennis Gall, Annfield, Millhill, Stirling. 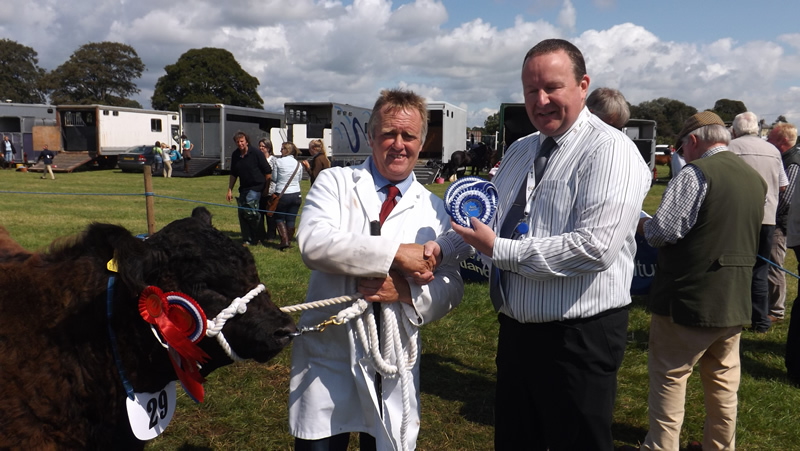 Galloways came home and they did it in style, an outstanding show of Galloways was presented in front of well-known Galloway veteran Mr Dennis Gall. 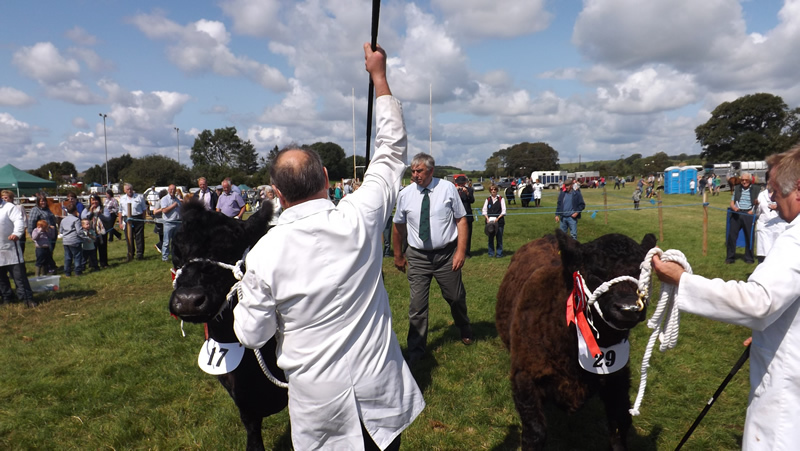 The tenth National Show was held in the heartland of Galloway Country at Stewartry show and was proclaimed to be one of the best shows to date. 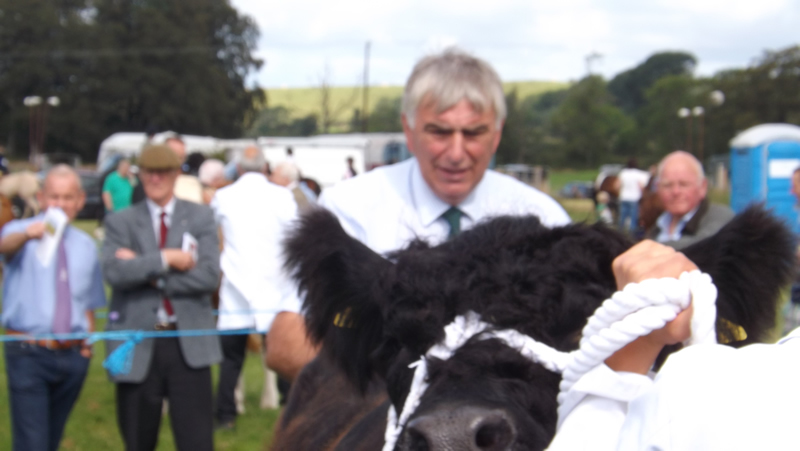 An outstanding show of Galloways was forward and this was confirmed when the Champion received the Champion of Champions award. 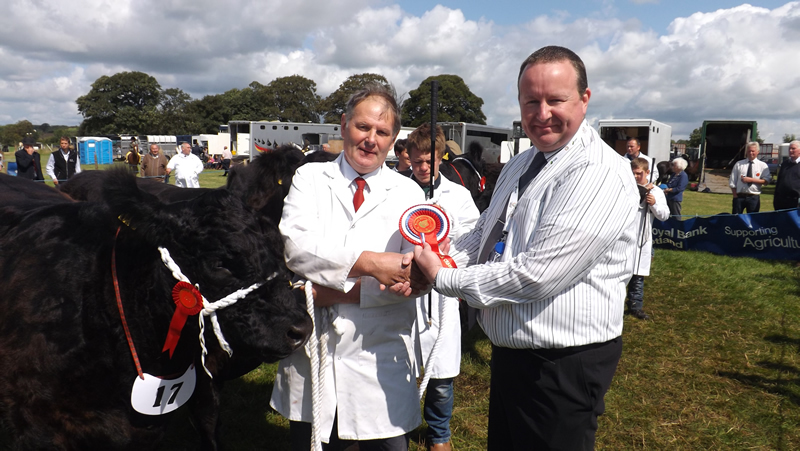 Well respected judge Mr Dennis Gall awarded the female and overall champion award to local family J & S Ross, Romesbeoch, Shawhead, Dumfries, their stylish heifer, Nerys 1306 of Romesbeoch (ET) is by Kirkmabreck Nimrod and out of the famous show cow Doon of Urr Nerys 42nd who herself has won the National Show award twice. This September 2011 is no stranger to championship rosettes as she was breed champion and native champion at the 2013 Great Yorkshire show, reserve champion at this year’s Royal Highland show and breed champion and reserve interbreed champion at The Great Yorkshire show last month. This was just one of the many awards which included the pairs and group of three the Team Ross collected for an excellent line up of cattle, Jim, Selina, Dougie, Carolyn, Hayden, McKenzie and Logan also received Junior Champion for Beauty C1437 of Romesbeoch, this September 2012 Kirkmabreck Nimrod daughter is out of Beauty C548 of Romesbeoch. Nerys 1307 of Romesbeoch (ET) a full ET sister to the champion was awarded the Reserve Female championship, just two days younger than the overall champion, this was her first outing. Ending an amazing day for the Ross Family, Nerys 1306 was awarded the champion of champions award, placed above the sheep, dairy and horse champion. Reserve Overall, Male champion and Junior Reserve Champion was from another well-known Galloway family, the Finlay family from Blackcraig, Corsock, John, Ann, Iain and Kelly had a tremoudous line up of cattle on parade and it was one of the youngest cattle forward which received the championship rosettes. Blackcraig Vidicator, an October 2013 born calf is by Blackcraig Rasputin and out of FinMac Sally N194 (ET). This was his first time out and he might stay at Blackcraig as his father died at the end of 2013. Klondyke Solution exhibited by Klondyke Farms Ltd was reserve male champion, this April 2009 born Holsten Ed son was male champion at the 2014 Royal Highland show and is now senior stock bull at Shancastle, Moniaive. The last and very important job of the day for Dennis was judging the Young Handlers competition, after much deliberation he award first place and the very handsome Maxwell trophy to the Beth Harvey, Glasgow, 2nd to McKenzie Ross, Romesbeoch and 3rd to Kirsten Wallace, Fingland. Our thanks goes to all our sponsors, listed below, this event could not go on without their support and helpers who helped at the Society BBQ the Night before where a very pleasant night was had by all and during the show making tea and coffee. BULL BORN ON OR AFTER 1ST SEPTEMBER 2012. COW IN CALF OR IN MILK BORN ON OR AFTER 1ST SEPTEMBER 2010 AND BEFORE 1ST SEPTEMBER 2011. 3rd Mr M McCornick, Barquhill Farm, Wigtown, Newton Stewart – Blackcraig Moss Rose T426 Sire FinMac Norseman (ET) Dam Blakcraig Moss Rose P276.